There is a flaw in Abode Bridge, in that you cannot add multiple keywords at once to an image. You have to apply one keyword, close down Bridge and then open it again to add another keyword to the same image. When you try to add multiple keywords at once a dialogue box appears saying there was an error. There must be a way to apply multiple tags to a single image without having to shut the program down between tags. Did you put a comma or semicolon between each keyword? Can you post a screen shot of the error you're getting? 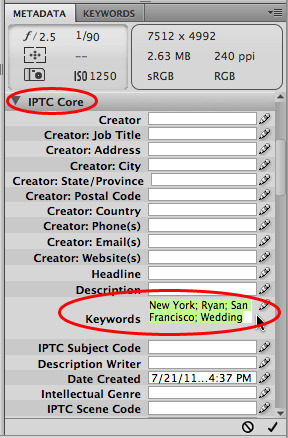 Let us know if you get the same error typing in the keywords in the Metadata panel as opposed to using the Keywords panel. Also, what version of Bridge are you running? Do you have the updates installed? I am able to type the keywords into the metadata, but I need to access the names from the keywords panel as we are adding dozens of staff members in each photo so it would be ideal to be able to apply multiple names to each image by selecting the premade keywords. Also, I am running version CS5. 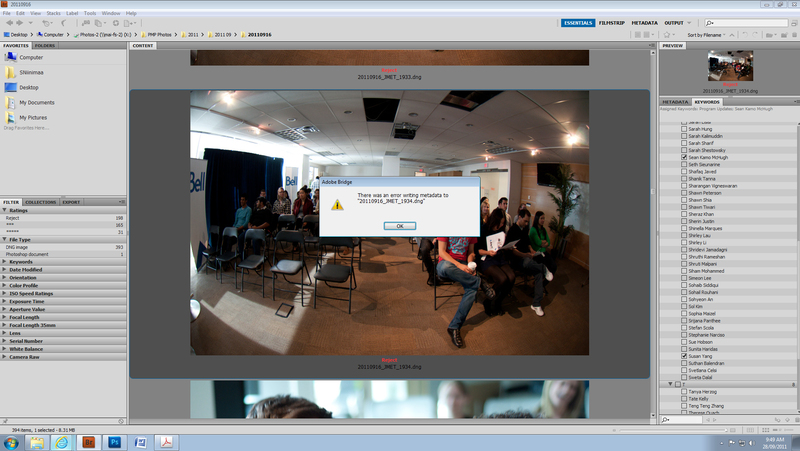 This is the screen capture of what the error message looks like. OK. Yup, I realize it will be easier to use the keyword panel, just need to try some other things to try and narrow down the issue. If you choose, Help>About Bridge... what version # is displayed? The version is 4.0.0.529. I am also running the program on a Dell computer if that has anything to do with it. I've spoken to a co worker who is on a MAC and she does not seem to have the same problem. One of our computers in our system was updated to the lastest version of Bridge but the same problem is occuring. If you have any other suggestions that would be great. Can you add keywords correctly if you copy the images to your desktop? Where are your images? Are they on an external disk? Do you need to access them through network? The images are on a shared network between 100 employees. We tag hundreds of photos per week and would likely not be able to copy them to the desktop. Make sure you answer all Jingshu's questions. If the files are on your desktop, can you add keywords then? And does it also happen on non-rejected files? 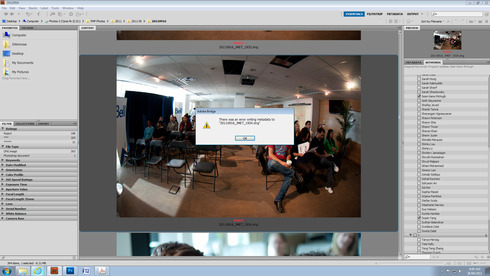 I don't mean you need to copy your images to the desktop to solve your issue. I just want to make it clear whether your issue is an access permission issue or not. So last time I ask you to copy the images to your desktop and try again. a. What's your images file format, JPG, DNG, or camera raw files, or others? b. If you still cannot apply keyword to the images when you copy the images to your desktop, could you please tell me what OS do you use to run Bridge? And could you please provide a sample image to me? c-1. Does any other employee in your office have same issue with yours? c-2. Do you have enough access permission (such as administrator) to the shared images? c-3. You said the images are shared. What's the OS of your images shared server? c-4. If the images are on an external disk, can you tell me the file system of the external disk (such as NTFS, FAT32...)?